Abbreviations: GABA, y aminobutyric acid; T1R, taste 1 receptor; SSTR, somatostatin receptor; CCR, chemokine receptor; TRHR, thyrotropin-releasing hormone receptor. ties (58-77). There are also some examples of heterodimerization in which one of the GPCRs in the heterodimer is inactivated (78-80). Examples of these scenarios are described in the following Subheadings 3.1.-3.3. A fundamental role for GPCR heterodimerization in generating active receptors has been observed in naturally occurring metabotropic y-aminobutyric acid (GABA)b receptors. In a series of seminal studies, researchers demonstrated that the co-expression of nonfunctional GABAB-R1 and GABAB-R2 receptors resulted in a functional receptor, as evidenced by the high-affinity GABA binding and G protein activation (49-51). In fact, when expressed alone, neither receptor is capable of activating inwardly rectifying potassium channels; heterodimeric assembly of GABAB-R1 and GABAB-R2 is required for the efficient signaling of GABAB receptors through these channels (49-52). We now know that GABAB-R2 is required for the cell-surface expression of GABAB-R1 (53). Heterodimerization of the two receptors results in the masking of an endoplasmic reticulum retention signal on GABAB-R1, allowing the proper targeting of the assembled complexes to the plasma membrane (54). Therefore, the heterodimeric interaction between GABAB-R1 and GABAB-R2 receptors appears to be a prerequisite for the formation of a fully functional GABAB receptor. Similarly, heterodimerization of mammalian taste receptors is required for the recognition of specific tastes. The mammalian amino acid taste receptors T1R1 and T1R3 have been shown to function as heterodimers (55). These heterodimers function as L-amino acid sensors but do not respond to D-enantiomers or other compounds. The same T1R3 receptors also dimerize with T1R2 receptors to function as broadly tuned sweet sensors, recognizing a number of sweet-tasting molecules (56,57). Although the cases described here represent those for which obligatory heterodimerization has been firmly established, there are numerous other examples in which heterodimerization appears to play a crucial role in increasing pharmacological diversity by altering the various properties of individual receptors. Many of these receptor pairs are discussed in the Subheading 3.2. Heterodimerization has been shown to modulate the ligand-binding, signaling, and receptor-trafficking properties of several related GPCRs. In the case of the opioid receptor family, 5-opioid receptors have been shown to interact with both k- and ^-opioid receptors to form heterodimers with altered pharmacological properties (58,59). In the case of interactions between k- and 5-receptors, the resultant k-5 heterodimers were found to have greatly reduced affinities for highly selective k- or 5-receptor ligands but had enhanced affinities for partially selective ligands (58). In the presence of a 5-selective agonist, a K-selective agonist bound to the receptors with high affinity, and, reciprocally, a K-selective agonist increased the binding of a 5-selective agonist. Cells co-expressing k- and 5-receptors also exhibited synergistic effects on agonist-induced signaling (as measured by cAMP and phosphorylated mitogen-activated protein kinase levels). Finally, dimerization was found to affect the trafficking properties of these receptors because etorphine-induced trafficking of the 5 receptor was significantly reduced in cells expressing k-5 heterodimers, suggesting that 5-receptors are retained at the cell surface as a result of dimerization with K-receptors (58). Studies with ^-5 heterodimers have also demonstrated decreased binding affinity to selective synthetic agonists (60). The rank order of agonist affinities for the heterodimeric receptors was different from that of the individual receptors, suggesting allosteric modulation of the binding pocket (59,60). Treatment of cells expressing ^-5 heterodimers with very low doses of 5-selective ligands produced a significant increase in the binding of a ^-selec-tive agonist; this increase was seen irrespective of the temperature at which the binding assay was performed (Fig. 2). This treatment also enhanced receptor-mediated signaling (59,61). It is possible that the heterodimeric 5 complex associates with pertussis toxin-insensitive G proteins, because treatment with pertussis toxin did not abolish the synergistic binding (Fig. 3) and signaling (60). Therefore, the unique properties of ^-5 and k-5-receptor dimers suggest that heterodimerization may at least partially account for pharmacologically characterized opioid receptor subtypes for which genes have not been isolated. Fig. 2. Effect of temperature on potentiation of ^-agonist binding by S-antago-nist. Chinese hamster ovary (CHO) cells stably co-expressing Flag-tagged and myc-tagged S-opioid receptors were plated into 24-well plates (5 x 105 cells/well). The plates were kept at either 4°C (A), 10°C (B), room temperature (C), or 37°C (D). Cells were then incubated with [3H]DAMGO (0.1-10 nM) in the presence or absence of 10 nM TIPPY for 2 h at the temperatures mentioned. Nonspecific binding was determined in the presence of 1 ^M of DAMGO or diprenorphine. Wells were washed three times with 50 mM of ice-cold Tris-Cl, pH 7.5. Cells were lysed overnight with 1 N of NaOH and neutralized with 1 N of HCl, and radioactivity was collected and measured in a scintillation counter. Results are mean ± SEM of 3 experiments in triplicate. receptor lacking its ligand-binding site with a mutant SSTR1 receptor containing a C-tail deletion (which is thus unable to signal) led to a significant increase in receptor signaling, as evidenced by somatostatin-induced adenylyl cyclase inhibition (19). This further supports a role for heterodimerization in modulating receptor signaling properties. Heterodimers of closely related receptors exhibiting altered signaling and/ or trafficking properties have also been reported for the D3-D2 dopamine (62), TRHR1-TRHR2 (32), a1a-a1b adrenergic (63), a2a-p1 adrenergic (64), and CCR2-CCR5 chemokine receptors (65). In the case of CCR2-CCR5, it was shown that heterodimers were more efficient at inducing a biological response than either receptor alone (65). Additionally, although both CCR2 and CCR5 normally associate with Gai proteins, CCR2-CCR5 heterodimers were able to recruit Gq/11 proteins and trigger a pertussis toxin-resistant calcium flux (65). Taken together, these studies show that heterodimerization between specific subtypes of a GPCR can lead to alterations in pharmacological, signaling, and trafficking properties, which may account for the wide range of biological responses that follow receptor activation. Heterodimeric assembly between the SSTR5 receptor and the structurally related D2 dopamine receptor generated a novel receptor that was pharmacologically distinct from either of its receptor homodimers (66). It is believed that heterodimerization between these receptors may explain some of the biological interactions observed between these two neurotransmitters (67). The D2-SSTR5 receptor heterodimer had a greater affinity for both dopam-ine and SST receptor agonists and exhibited enhanced G protein and effector coupling to adenylyl cyclase. As observed with opioid receptor dimers, synergistic binding of dopamine and SST receptor agonists occurred in D2-SSTR5 heterodimers. Additionally, the heterodimeric D2-SSTR5 receptor appeared to be most efficient when simultaneously occupied by its two agonists (66). Interestingly, a dopamine receptor antagonist produced a decrease in the binding of a SSTR selective agonist. These results are in contrast to ^-5 heterodimers, in which the 5-antagonist promoted an increase in the binding and signaling by the ^-receptor selective agonist (59,61). Fig. 3. Synergistic interactions between and S-opioid receptors persist after treatment with pertussis toxin. Chinese hamster ovary (CHO) cells stably co-expressing Flag-tagged and myc-tagged S-opioid receptors were plated into 24-well plates (5 x 105 cells/well). On the day of the assay, cells were untreated (control) or pretreated with 15 ng/mL of pertussis toxin (PTX) for 3 h at 37°C. 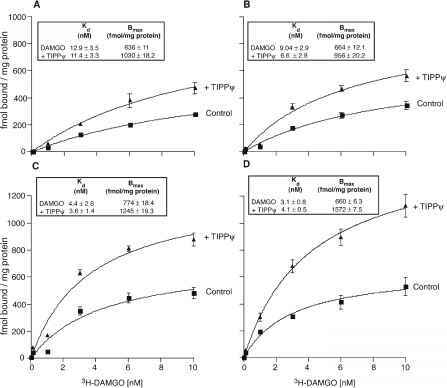 Cells were then incubated with 10 nM of [3H]DAMGO in the presence or absence of either TIPP¥, Delt II, or DPDPE (final concentration: 10 nM) for 2 h at 37°C. Nonspecific binding was determined in the presence of 1 ^M of DAMGO or diprenorphine. Wells were washed three times with 50 mM of ice-cold Tris-Cl, pH 7.5. Cells were lysed overnight with 1 N of NaOH and neutralized with 1 N of HCl, and radioactivity was collected and measured in a scintillation counter. Results are mean ± SEM of 3 experiments in triplicate. receptor co-internalization (69). A similar effect was observed with A2AR-D2R heterodimers (70). The interactions between adenosine and dopamine receptors are believed to be responsible for the ability of adenosine agonists to inhibit and adenosine antagonists to potentiate the behavioral effects induced by dopamine agonists. This may be relevant for the development of adenosine and dopamine antagonists/agonists for the treatment of neuropsychiatry diseases in which D2R has been implicated, such as Parkinson's disease, schizophrenia, Huntington's disease, and dystonia. (ERK1/2) phosphorylation and on the expression of the immediate-early gene c-fos (72). A similar synergistic effect on c-fos expression was also observed in striatal sections after administration of A2AR and mGluR5 selective agonists to rats with intact dopaminergic innervation (72). These results indicate that A2AR-mGluR5 interactions may be involved in striatal neuronal plasticity, such as long-term potentiation and depression. Heterodimerization of two different vasoactive hormone receptors, the angiotensin II type 1 (AT1R) receptor and bradykinin B2 receptor (B2R), affects the signaling and trafficking of these receptors (73). Co-expression of AT1R and B2R increased the efficacy and potency of angiotensin II but decreased the efficacy and potency of bradykinin. Additionally, angiotensin-stimulated activation of Gai and G^ proteins was increased by heterodimerization of the AT1R and B2R, independently of bradykinin binding. Finally, internalization of AT1R-B2R heterodimers occurred by a dynamin-dependent mechanism, as opposed to the endocytotic pathway of the individual receptors, which is dynamin- and clathrin-independent (73). Interestingly, it has been shown that pre-eclamptic hypertensive women exhibit a significant increase in the levels of AT1R-B2R heterodimers, which display increased sensitivity toward an-giotensin II. Thus, the hypertension in pre-eclampsia may be related to an increase in AT1R-B2R heterodimers in platelets (74). 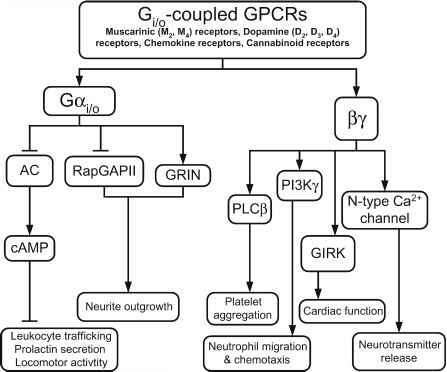 Heterodimerization between members of two distinct GPCR subfamilies has also been demonstrated using 5 or K-opioid receptors (receptors that couple to inhibitory G proteins) and P2-ARs (receptors that couple to stimulatory G proteins) (75). Although dimerization of opioid receptors with P2-receptors did not significantly alter ligand-binding properties, it did affect receptor trafficking. When co-expressed with 5-receptors, which normally internalize rapidly, p2-receptors underwent opioid-mediated endocytosis. However, when co-expressed with K-receptors, which do not internalize rapidly, p2-receptors did not undergo endocytosis in response to isoproterenol or opioids. Additionally, the loss of p2-receptor internalization was accompanied by some loss of receptor signaling in k-P2 cells (75). In light of these results, it is conceivable that opioid receptors and p2-receptors physically associate in vivo to influence each other's function. For example, cardiac effects mediated by opioids (such as bradycardia) may, to some extent, result from dimerization between opioid receptors and p2 receptors. The ^-opioid receptor has also been shown to heterodimerize with distantly related GPCRs such as SSTR2A (76), a2A-AR (77), or substance P (78) receptors. These receptor heterodimers exhibit properties that are quite distinct from each individual receptor, again indicating that heterodimerization may serve to increase the functional diversity of individual receptors. We have seen that in many cases, GPCR dimerization results in the modulation of receptor activity to exhibit enhanced function. However, heterodimerization can also result in a decrease in the activity of a fully functional receptor, in which case one of the receptors forming the heterodimer no longer signals in response to its agonist. This has been observed with SSTR2A-SSTR3 receptor heterodimers (79). These heterodimers had a high affinity for an SSTR2-selective agonist but displayed a 100-fold lower affinity for an SSTR3-selective agonist. Additionally, although an SSTR2A-selective ligand stimulated strong GTPyS binding, adenylyl cyclase inhibition, and ERK1/2 activation in cells expressing the heterodimers, an SSTR3-selective agonist had no effect on signaling. These findings imply that SSTR2A-SSTR3 heterodimerization generates a receptor with a ligand-binding site and a functional profile resembling that of the SSTR2A receptor. On the other hand, the SSTR3 receptor is rendered inactive by heterodimerization. Additionally, SSTR2A-SSTR3 heterodimerization alters the desensitization rate of the receptor (79). Similarly, heterodimerization of P1- and P2-ARs has been shown to inhibit P2-receptor function in HEK293 cells (80). Although adenylyl cyclase activity was unaltered in cells expressing P1-P2 heterodimers, the ability of the p2-receptor to activate the ERK1/2 signaling pathway was lost. Also, heterodimerization of P1- and p2-receptors prevented agonist-induced internalization of the p2-receptor. Given that cardiac cells naturally express both P1- and P2-receptors and that P2-receptor stimulation does result in ERK1/2 signaling in vivo, a mechanism for the sequestration of P2-receptors from P1-receptors may be required for P2-receptor function. An interesting case is that of p-a2A heterodimers, in which co-activation of both receptors leads to a decrease in signaling, whereas activation with ligands to either receptor leads to an increase in signaling. These observations were also made in primary spinal cord neurons, suggesting that these receptor interactions may play an important role in modulating pain transmission (77). Heterodimerization-mediated inactivation of a fully functional receptor can have important physiological consequences. This is illustrated in the case of AT1R-AT2Rheterodimerization (81). AT2Rbinds directly to AT1R, resulting in a decrease in receptor function (81). This observation was made in cultured cells as well as human myometrial biopsies. The physiological relevance of AT1R-AT2R heterodimerization is evident during pregnancy, when the level of AT2R is seen to decrease and angiotensin II responsiveness of the myometrium increases (78). Another example is provided by heterodimers between a naturally occurring mutant of the CCR2 chemokine receptor CCR2V64I (this mutation occurs at an allelic frequency of 10-25%) and chemokine CCR5 or CXCR4 receptors (82). The human immunodeficiency virus (HIV) gains entry into cells via interaction with CCR5 or CXCR4 receptors. However, association of CCR2V64I with either receptor prevents HIV access to the cell (82) and is the likely mechanism underlying the ability of CCR2V64I to delay the progression of acquired immunodeficiency syndrome for 2 to 4 years in patients carrying this mutation. Taken together, these results suggest alterations in receptor heterodimerization in normal cell physiology and disease states. Therefore, developing drugs that selectively target receptor heterodimers would be of importance in the case of various pathologies.